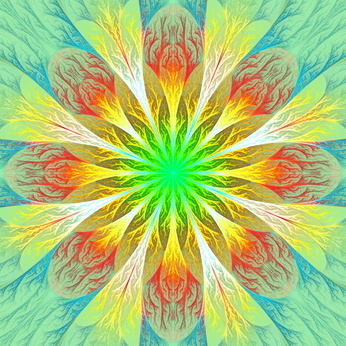 Beautiful fractal flower in green and yellow. Computer generated graphics. In our modern world it has become normal to seek instant gratification of things, material and non-material, including happiness. Many people are looking for contentment, but very few people are actually finding it. Why are they not finding it? Simple, they are looking in the wrong place. They are looking outside of themselves instead of looking where true happiness is found – within. What is it that actually generates happiness? Well it all starts with one’s perception, which is intimately linked to the emotional system. How we perceive dictates how we feel. So knowing this, what makes us happy? It is actually how you perceive that changes your emotion. You are the sole creator of how you feel. So really your happiness is not determined by what is outside of you, it is totally manifest through an internal mechanism. Once again it’s simple – happiness is an internal manifestation brought into being via perception. If i can perceive anything at all from a positive non-lacking truth, I will always feel happy. I am the sole creator of my happiness, not some external thing or person. I am totally responsible for my happiness or misery. So if i feel unhappy, I need to look within, as I am the one creating this emotion. I will let you in on a little secret – we are not actually lacking happiness, we just think we are. We think this way because of our past negative, lack-infused conditioning. Unhappiness is a deluded state of existence based on a mind-made distorted perception of how life works and how much the mind believes in lack (non-truth). We also manifest unhappiness for ourselves because of our non-truthful belief that we are not valuable or don’t deserve love. If you are seeking happiness, look within not outside of yourself. If you become aware you feel negative or down in your emotions, just ask yourself the question “what non-truth am I currently believing and what is the truth in regards to this emotion?” Once you put forward this thought in your mind, just sit and allow in a non-judgemental way and watch your emotion shift into positivity. This entry was posted in Uncategorized and tagged #ascension, #beinghappy, #consciouslife, #Divinelove, #healthylife, #HeartResonance, #innerpeace, #meditation #spirituality #Happiness, #trevorgollagher, Divine Love. Bookmark the permalink.